Contact Downtown Miami Truck Accident Lawyers Gerson & Schwartz, P.A. No one thinks of big trucks when thinking about Downtown Miami, but they are here. US 1, Interstate-95, MacArthur Causeway, West Flagler Street, I-195 and I-395 are just some of the usual locations where Downtown Miami truck accidents happen. Interstate-95 is the second deadliest highway in Florida, but these crashes also occur on smaller streets. Have you or a loved one of yours got injured in a truck accident in Downtown Miami? You are not alone. You have to talk to a Downtown Miami truck accident lawyer as soon as possible to help you handle the damages recovery process properly right from the beginning. In these situations, starting right is crucial for the damages compensation procedures. There are things that you should or shouldn't say, and there is evidence that needs to be gathered sooner than later. That's where the free initial consultations with the Miami personal injury attorneys at Gerson & Schwartz come handy. At no cost, you can learn whether you should pursue financial compensation for your harms and losses, how much the case could be worth, and how long the compensation process may take. Contact us at (305) 371-6000, tell us what happened, and we will tell you what your options are. For now, do not accept any settlement proposals before talking to a lawyer and discussing the offer, because it may not be enough to cover for all your expenses. If an trucking company or insurance company comes to you with an offer right after the accident, we assure you that you need at least speak with a Downtown Miami truck accident lawyer immediately. We handle cases on a contingency basis, which means that you’ll pay nothing until we get you compensated. 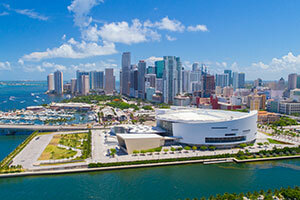 Downtown Miami is the center of the Miami metropolitan area and the Miami-Dade County. It consists of many sub-neighborhoods, including Brickell, Historic District, Omni, Government Center, and Park West. Some people will tell you about the Jewelry District, which is part of Brickell. Around 90,000 people are living there regularly, usually called Downtowners. However, the daylight population is around 250,000. There are many people who come here for work and many others who come to visit and entertain. Don’t go through these procedures alone. We handle cases on a contingency basis, so you won’t incur any expenses until we recover for you. Call us at Gerson & Schwartz for help with your accident. We offer free initial consultations at (305) 371-6000. Reach us now and let’s get to work.